While I might not have produced as much studio work in 2015 that I'd hoped to, I'm confident I spent my energy in all the right places. In addition to taking some fabulous art classes and workshops (more on that in a separate post), I participated in some truly amazing community-based art projects, locally and globally, thanks to the power of social media and the Internet. When I look back on it all, the icing on the cake was making new friends and meeting some of my art idols along the way - pinch me! What an honor it is to say that my daughter's quilted yellow jacket was included in Lisa Solomon's The Keepsake Project. For her residency program at Irving Street Projects in San Francisco, Lisa invited the public to share items of special or sentimental meaning. She wanted to get to know the stories behind the keepsakes and create a collection of original mixed-media paintings based on photographs she took of the items. She and Kelly Inouye, artist and owner of Irving Street Projects, hosted a reception in early December to showcase Lisa's prolific body of work. I invite you to learn more about my keepsake and how Lisa brought it to life through a beautiful mixed-media painting -- just visit my Community Art The Keepsake Project gallery page. Thank you for everything Lisa + Kelly! Pictured L-R: A goofy-looking me standing next to one of my idols, Lisa Solomon, during the closing reception at Irving Street Projects. It was such a treat to meet her adorable family and see first-hand her phenomenal work capturing everyone's keepsakes -- a dream come true! Pictured at top: Lisa's photograph of the quilted jacket my youngest daughter Addie wore on the day she became a part of the family in China. Below is the keepsake description along with Lisa's masterful rendition of Addie's coat (paint with embroidery thread). CHROMA Installation was the brainchild of renowned artists Lisa Solomon and Christine Buckton Tillman that explored color theory through everyday objects. Lisa and Christine invited people to contribute small-ish items for what would become a massive, eye-popping installation at Gallery CA in Baltimore, MD. Below is a snapshot of my contribution, but to get a better sense of the magnitude and brilliance of the project, please visit the following CHROMA links (you'll be happy you did! ): tumblr, instagram, Lisa's portfolio, Christine's portfolio, and BmoreArt's "Life in Color" article. Thank you Lisa and Christine! My CHROMA installation. As images from the project flooded in on social media, I found myself obsessed with trying to find my items amongst the sea of color -- a 'Where's Waldo' if you will. I hopped, skipped, and jumped at the chance to transform matchbooks into art for the amazing #STRIKEAWAY Show, curated by artists/authors Courtney Cerruti and Alicia Dornadic. You could say this project was 'right up my alley'-ha!) My "Strikeaway Lanes" and "Floral Brooch" were shown at Paxton Gate Kids in San Francisco, CA 5/22-6/30 alongside nearly 450 other pieces from 225 artists from the globe. Click here to view the making of my pieces. To learn more about the show click here. To see other pieces, check out the show's instagram feed. Thank you Courtney and Alicia! 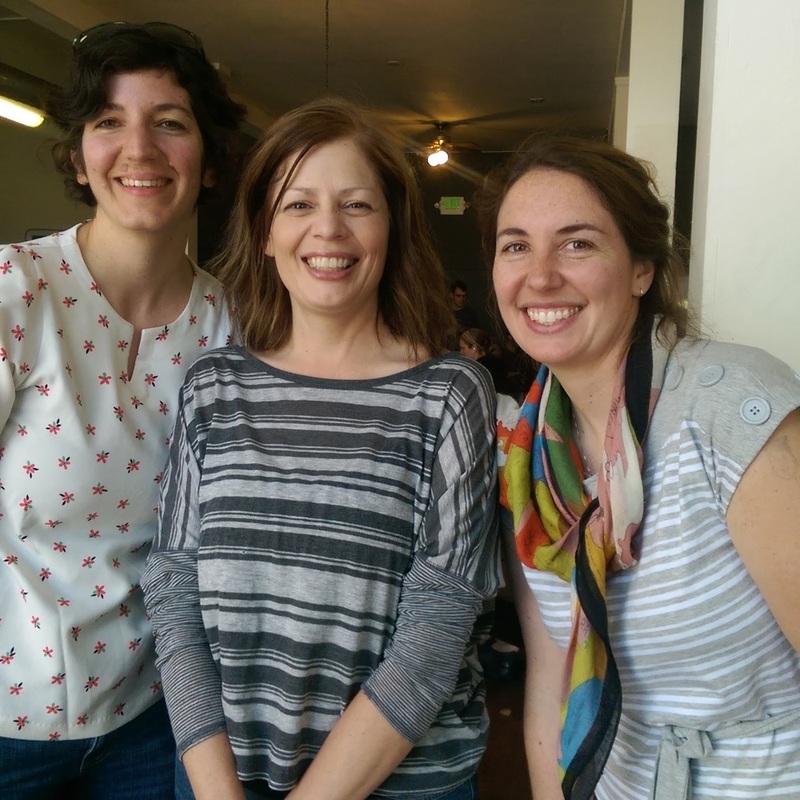 Pictured L-R: Alicia Dornadic, me, and Courtney Cerrutti on the day these uber-talented ladies were accepting submissions in Temescal (Oakland, CA). Lucky me! My #STRIKEAWAY Show submissions: "Floral Brooch" was sold at the show and "Strikeaway Lanes" was featured on The Jealous Curator! As a longtime fan of Danielle and her blog, The Jealous Curator, I could't pass up the opportunity to participate in one of her #creativeUNblock art challenges (a year-long, monthly series based on interviews with artists in her top-selling book, Creative Block). 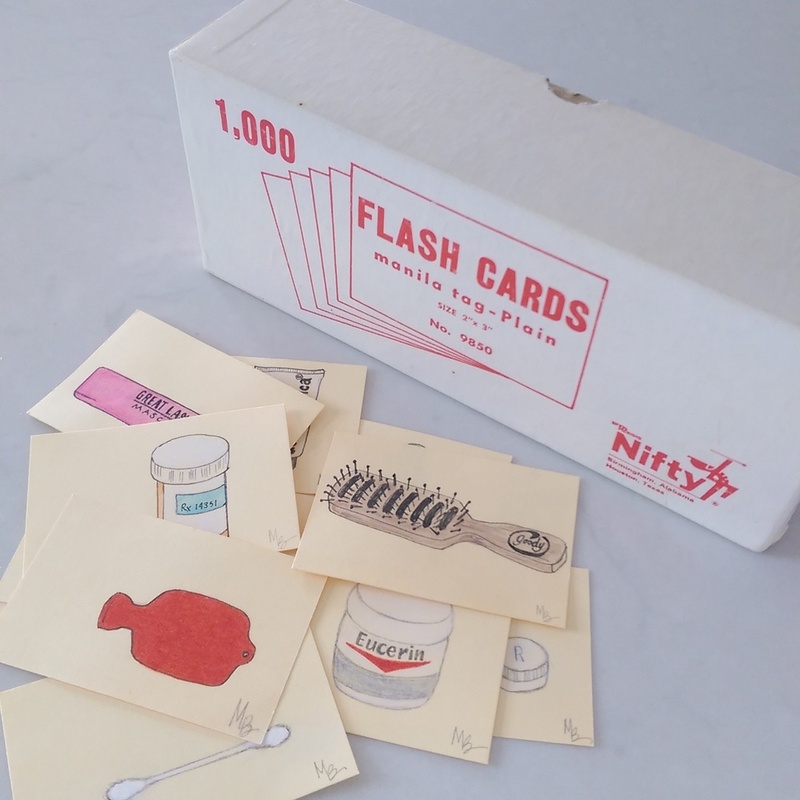 I chose February's challenge inspired by Portland-based artist Kate Bingaman-Burt and spent the month cataloging my medicine cabinet using a set of retro Nifty cards from a dear aunt with colored pencils and ink. Click here to view all my cards. Thank you Danielle and Kate! Items from my medicine cabinet captured on Nifty cards with colored pencil and ink. I loved it back in 2011 so much so that I joined The Sketchbook Project's 2015 Tour and chose "Pushers" for my challenge. Being a part of a larger movement with artists from around the world is what made this project truly special. Click here to view the sketchbook. "989 00" installment: my "Pushers" sketchbook for the 2015 Tour. (Colored pencil and ink drawing of my dusting brush that's served me well for 17+ years).